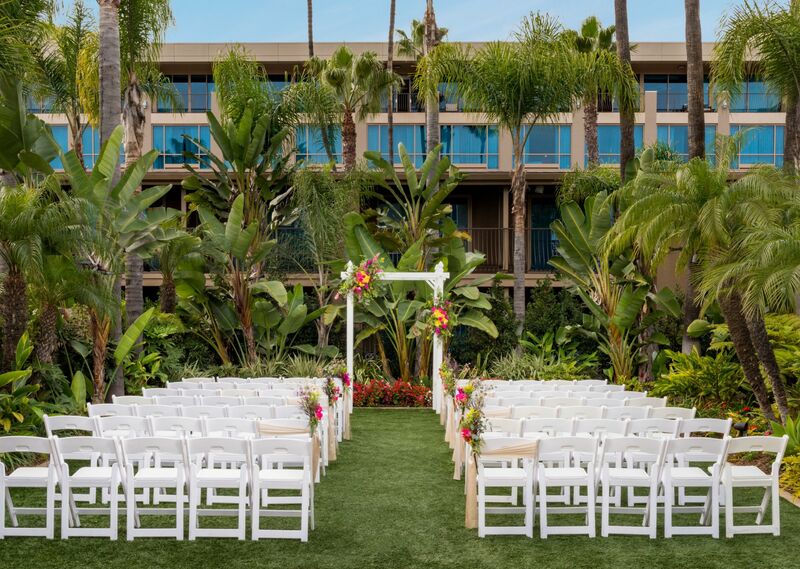 Read our San Diego wedding venue reviews, and learn how the exquisite event spaces and professional staff at Holiday Inn Bayside make for a truly unique waterfront destination. I would highly recommend this hotel for couples who are looking for a great venue to celebrate their big day. We had our wedding ceremony and cocktail reception at the poolside deck which was beautifully decorated (tropical lush feel). Our reception was at the Harborview room with great ambiance overlooking the city and the marina and the setting had an intimate feel. Most importantly, our guests told us they loved and enjoyed all the food selection served in the buffet table so, kudos to the chef and catering team! Initially, we worked with Jenay Moore regarding the details of our wedding, she was very helpful and answered all our questions but she left a couple of weeks prior to our event but Dianne Rodrigues took her place and coordinated everything with us and she did a fantastic job. Overall, we were satisfied with the service this hotel provided. It worked well with our budget without sacrificing the quality of the location, accommodations and menu selection. Thank you for making June 25, 2016 a memorable day to us. The wedding glitter has settled, 4th of July craziness gone, all out of town guests back home . My house is Very Quiet so I have time to reflect. Thank you God for blessing us with a perfect wedding for our daughter Randi Nicole and her husband Christopher Wu's wedding. I cannot express my gratitude enough to Holiday Inn Bayside for going above and beyond to make everything sooo perfect. From the bottom of my heart , thank you Dianne Harvey Rodrigues for all of your hard work. Shannon for working with Di with all last minute details . Pat and your dining staff, Lynn and your dining staff for brunch. Everything was Absolutely magical, delicious and perfect. I would highly recommend Holiday Inn Bayside for any function you are planning. Professionalism, Heart , and lots of hard work is what they blessed us with. Thank you from the bottom of my heart for making such an Important day so Perfect....Such a Happy Heart ! Thank you.